This map is part of a series depicting the 40 largest cities in the United States (as ranked by CBSA). This series will run through the month of July. 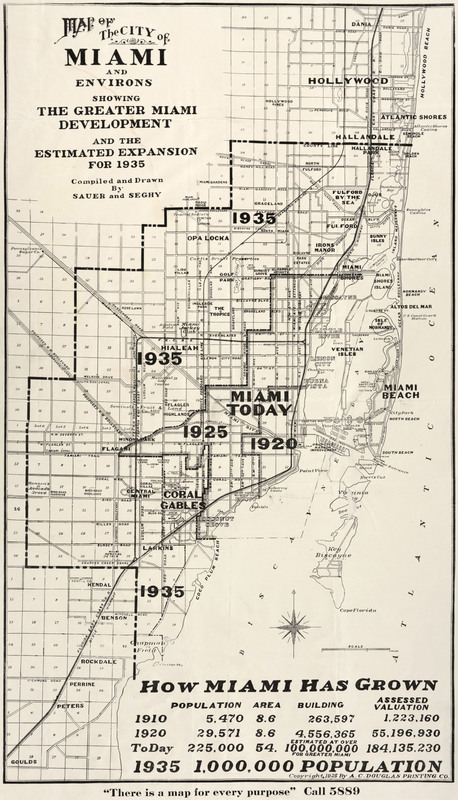 This map of the historical boundaries of Miami, Florida [gmap] isn't the most beautiful. But it's informative and interesting. I liked it quite a bit, at any rate. Edit: Reader "Jason" correctly points out that the map dates from 1925 (not 1935 as I had first reported), and tries to illustrate projected growth by 1935. Looks like there's some number-fudging going on, though, with their current  estimates, and maybe some wild and optimistic speculation for their future  estimates. Their decennial numbers for 1920 are spot-on at 29,571. Their "ToDay"  figures claim 225,000 but were actually a third of that, and Miami fell short of the 1935 projection of a million people by about 870,000 people. The six-page report thumbnailed above is a probably a pretty alright read for Miami history buffs, and can be downloaded here as a 680kb PDF. Thanks a ton, Jason, for spotting the error and bringing it to my attention. I'm glad to get the opportunity to correct mistakes. 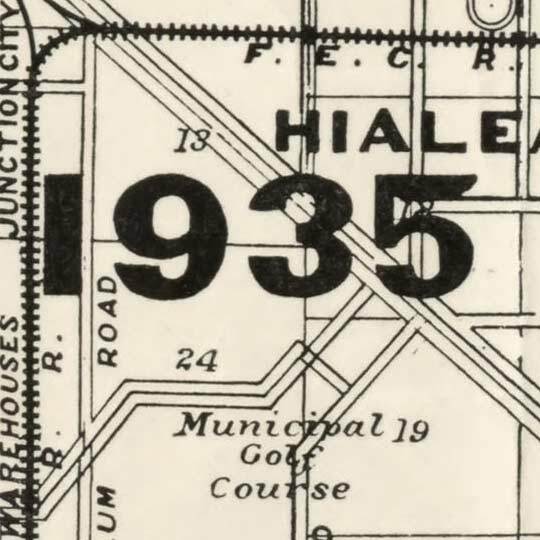 For more map resources and imagery from this period in Miami's history, check out the Florida Historical Society's website. The map is actually from 1925 (there’s a tiny copyright at the bottom) – it looks like they’re trying to predict how big it will be in 1935. Wonder how close they were? You’re absolutely correct. I’ve updated the page. It made for some interesting research. No problem – it was a pretty confusing description if you weren’t actually viewing it in 1925.